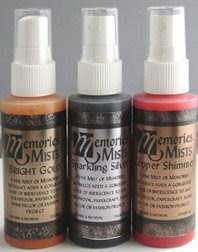 Have you ever tried any mists? Well, we uncovered some by Stewart Superior and just as the name suggests, these seem to be the best mists ever!!! Supplies: Stewart Superior Metallic Mists, Maya Road Wings, Bare Elements Giant Clothes Pins, Prima Flocked Alphabet Stickers, SnC Ribbons, Ranger Stickles. And now that I have seen this video, I am off to order all the colours!!! !